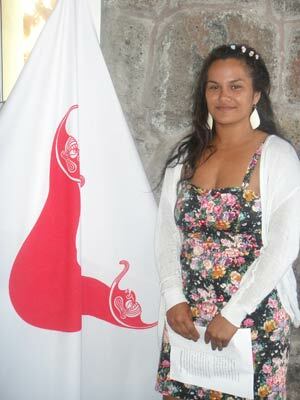 In 2010 the Fraternal Order of Moai donated a $4,500 to the Easter Island Foundation to fund two scholarships to be offered to Rapa Nui students for use in paying college expenses. Funds for this gift and other donations to the E.I.F. were raised at Ohana Luau at the Lake 2010 in Lake George, New York, and through sales of the limited edition "Music for Moai" CD. Merahi is studying archaeology in Santiago, Chile at the Universidad Internacional Sek. She is in her thesis seminar currently. For her thesis she is starting to set up a comparative starch grain collection to be used for identification of micro remains on archaeological tools from selected sites on the island. This will enable us to understand and resolve questions on Rapanui prehistory, such as use of gardening features, changes in food processing or food consumption in the past. When finished with the thesis she will attain the degree of Licenciada and the professional title of archaeologist. At the same time she is enrolled in the Master's program at the Universidad Academia Humanismo Cristiano, also in Santiago. This is a master's in social anthropology, where students can decide on three possible lines of research: visual anthropology, urban anthropology, and ethnic and multicultural studies. One year ago she decided to join the masters program since "it is necessary to internalize social topics to complement the archaeological works with the history and the sociocultural legacy of the island". 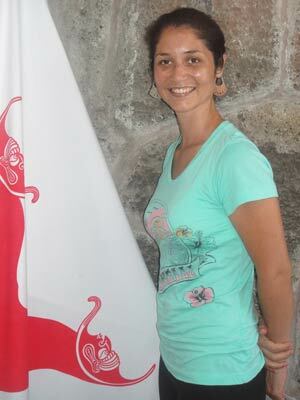 She decided to study archaeology "to be able to investigate the history of my culture and transmit my knowledge to the new generations of rapanui and this way promote the knowledge and the comprehension of the multicultural since to study the past allows us to examine and to project us as company". Merahi has impressed her advisors with her commitments to her studies, excellent performance and hard work. She won a short internship in Spain to work on an international project her Universidad Sek sponsors. She is interested in Pacific prehistory and one day wants to contribute with her knowledge in the investigation of "our past and the putting in value of our heritage". Vaitiare is in her last year of undergraduate studies in physical education at the Universidad de Viña del Mar, in Rodelillo, Chile. She would like to pursue Kinesiology and take various courses and specialize in the area of health for the disabled, and pregnant. She has many ideas about improving the quality of life of the disabled, especially those who might feel somewhat "abandoned". She would like to see a center established on the island for people with disabilities and pathologies, where they can receive the physical therapy they might need. Meanwhile here in the virtual islands, plans for Ohana Luau at the Lake 2011 in June are rolling along and proceeds from this event will help to fund another scholarship next year. Come join the Moai at the Lake and experience fun with a purpose for yourself. 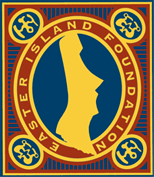 If you would like to support the work of the Easter Island Foundation, a non-profit 501(c)(3) organization, directly you can make a personal donation and become a Member. Tell 'em the Moai sent you.